One of the most beautiful regions of the California coast, Santa Barbara also has one of America’s most affluent and stylish demographics. Possessing the most summery, mild, seductive climate in the country, Santa Barbara has been an elegant and chic style destination since the turn of the last century, when wealthy East Coast families wintered there. Soon after, villas and estates were being built, designed by the finest architects and landscape designers. In recent years the Santa Barbara region continues to be an outpost of style and culture—now with many leading Hollywood producers, directors, and stars acquiring the historic estates for their weekend escapes. Today, cultured and stylish couples are living in Santa Barbara continuing the traditions of beautifully appointed mansions (many of them in the Spanish style first brought to California in the 1850s). 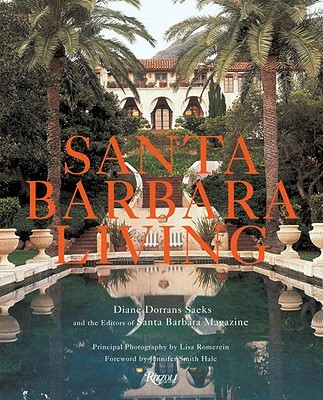 The first book to take readers inside the mansions and estates of Santa Barbara today, Santa Barbara Living will feature the houses and gardens that make Santa Barbara a rarified version of the American Dream. This book will show how that dream is lived. Diane Dorrans Saeks is the author of Hollywood Style, Palm Springs Living, and Michael Smith: Elements of Style. Jennifer Smith Hale is the founder and editorial director of Santa Barbara magazine. "...a glimpse into the haute homes and gorgeous gardens--that embody the distinctive panache of our coastal enclave." "This book is a luxurious addition to any library and gives readers sometimes a little sumptuous to strive for." M-F 10:00 a.m. - 5:30 p.m.